Offering both server-based and cloud-based options, DentiMax includes a comprehensive set of features and an intuitive, Windows-like user interface. Though maybe less well-known than other systems, it's a reliable option with a long track record of success, for those looking for an alternative to some of the bigger names on the market. 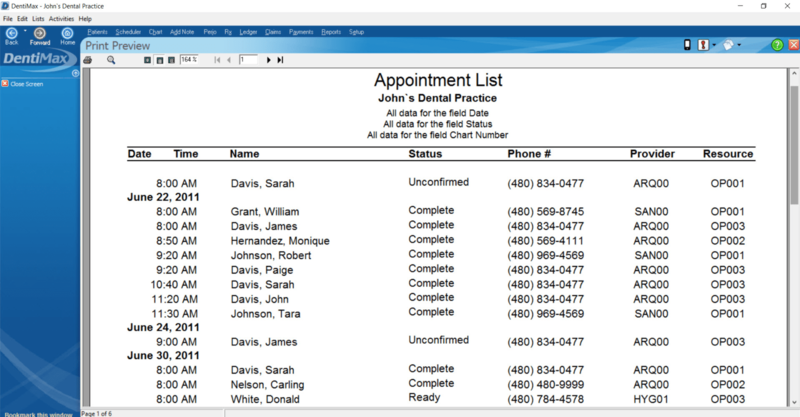 DentiMax is a popular dental practice management solution that includes a comprehensive set of features to help optimize your practice, and help you shift toward a paperless practice. The company has been around for over 12 years and as a result, has acquired a substantial, loyal customer base. DentiMax offers a cloud-based solution as well as an in-office, locally hosted option. Customers who are accustomed to using Windows will find the user interface to be very intuitive. 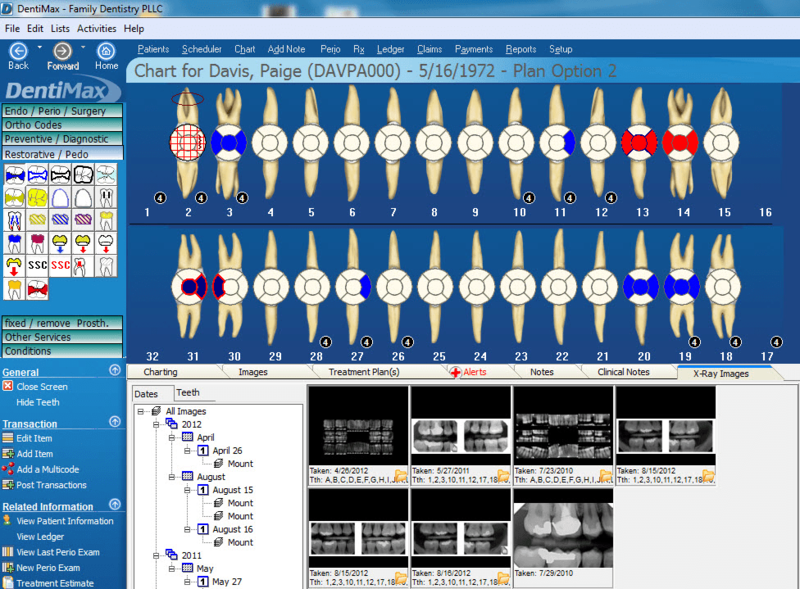 A unique feature is that DentiMax offers its own imaging sensors that you can purchase, which are integrated with the software’s charting system. This guarantees that you won’t run into any integration issues that might occur with other imaging sensors, though DentiMax also offers integrations with third-party sensors. DentiMax offers a separate EHR system, which is a Complete ONC-certified EHR that qualifies users for the Meaningful Use Incentive Program. Is DentiMax the right software for you? Most popular package is $199/month, which offers the complete practice management and all clinical charting, as well as perio charting (recommended). Offers traditional license-based pricing as well, though we recommend the month-to-month pricing. DentiMax is a complete, fully integrated practice management solution that has been serving dental practices for over 12 years. With ~30 full-time employees, you can be assured that the company has a strong staff of customer support working to make sure that your needs are satisfied. In addition to the practice management solution, DentiMax also sells its own X-ray sensors, as well as an ONC-certified EHR software. DentiMax EHR has helped many practices qualify for the Meaningful Use Incentive Program. 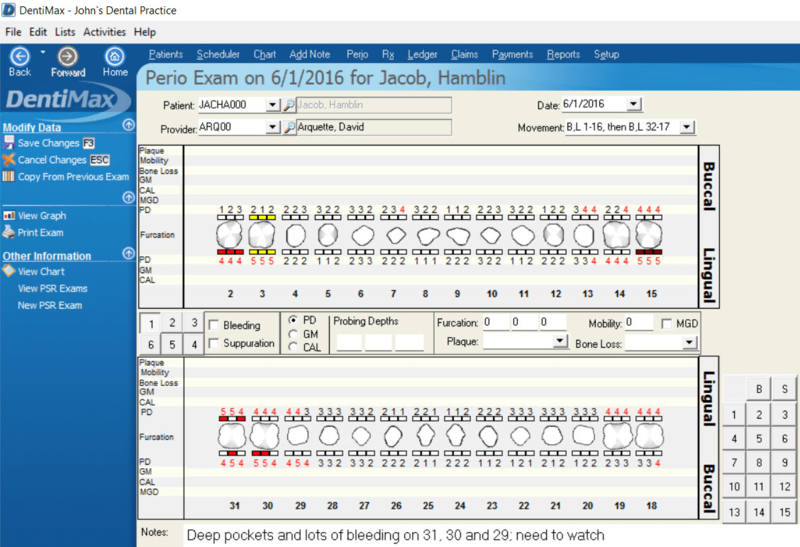 DentiMax’s practice management software features an intuitive Windows-like user interface, which makes it easy for Windows users to navigate. 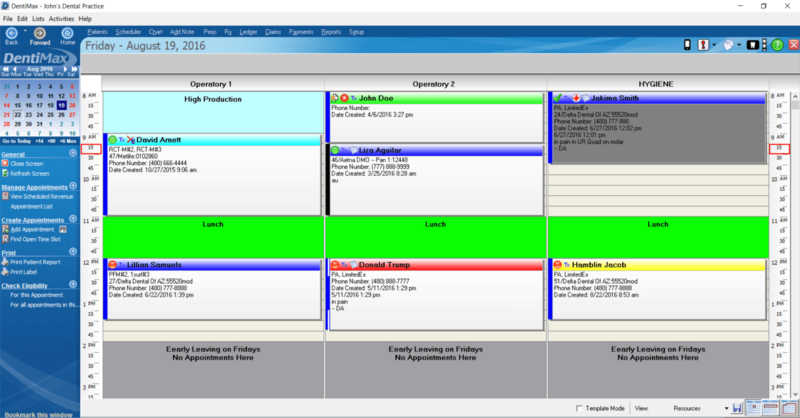 We like how tightly integrated the system is, which simplifies the process of managing your daily workflow. From scheduling and billing, to imaging and charting, and e-prescribing, DentiMax organizes everything in one central location to make it easy for your staff to transition to a paperless practice. Since DentiMax has been around for over 12 years, it traditionally offered its software as a local installation, which required users to purchase expensive hardware and back up their data themselves. As discussed here, there are many benefits to storing your data in the cloud, including ensuring that your data is encrypted and automatically backed up on a regular basis. DentiMax offers a cloud-based solution that will host, encrypt, and back up your data, ensuring that it can safely be accessed anytime, anywhere you have Internet access. Most of DentiMax’s new customers choose their cloud-based offering; however, many customers have been with DentiMax since before the cloud offering was available, which is why there are still a substantial number of customers using the local hosting option. The monthly cost of the cloud-based solution is the same as the cost of the locally hosted option, so we highly recommend going with the cloud-based version. There are different pricing tiers for the software, but the Complete Package (recommended) includes all of the practice management features at a cost of $199/month. Compared to other cloud-based practice management solutions, this price is below average, with other solutions charging ~$300/month. If for some reason you decide to leave DentiMax, they will provide you all of your data in a CSV via a secure encrypted connection for free. This is in contrast to some of its competitors who will charge you for your data, or give it to you in a format that will be difficult to use. Below, we discuss the key features of DentiMax, and how they can benefit your practice. DentiMax’s appointment book is one of the most comprehensive in the industry, and serves as an avenue to many other parts of the application. The appointment book is very informative—it links to each scheduled patient's record, which includes the patient's ledger, insurance information, allergies, appointment history, and more. 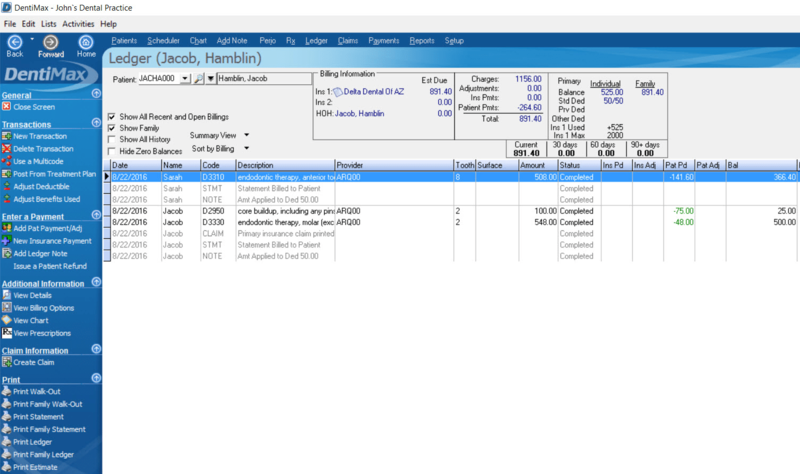 A unique feature of DentiMax’s appointment book is that it displays key financial information about scheduled revenue (what you plan to charge that day), posted charges (procedures that have been posted to the ledger but may not have been paid yet), and posted payments (actual cashflow) per day, week, or any other time period. This functionality helps you stay updated on your dental practice’s financial performance on an everyday basis. We also like that DentiMax links to each patient’s insurance benefits, so you can make sure that you only schedule procedures that are covered by the patient’s insurance. This is especially helpful when creating recall appointments, so that you can make sure to book appointments at the right frequency, based on the patient’s benefits. DentiMax offers two features to help boost patient retention: automatic appointment reminders and waiting lists. Using these features will help reduce no-shows and make sure that your practice has minimal vacancies. In the event that a patient does miss an appointment, you can mark an appointment as "missed" and leave a note about the reason the appointment was missed. The next time you try to schedule an appointment for that particular patient, the note will pop up to remind you about the patient's missed appointment info. You can also use this information to identify patients who are at high risk of being no-shows, and plan accordingly. Most recently, DentiMax has added integrated texting to their software. This allows you to automatically text appointment reminders, recall reminders, birthday greetings and even actively send text back and forth with your patients. After initially setting up “standard” text messages that are unique to your office, DentiMax will send text messages prompting patients to respond with a “Yes” to confirm their appointments. This in turn will automatically update their appointment to the status of confirmed. An additional text reminder can then be set to automatically go out at a later time or even the same day of the appointment. Additionally, text reminders are automatically sent to patients who are eligible for checkups/cleanings and birthday text are automatically sent to patients. DentiMax manufactures the Dream Sensor, which integrates with the software’s charting module. If you already have an existing imaging solution, DentiMax guarantees that its imaging software will work with any digital sensor on the market, with the exception of Dexis. DentiMax’s proprietary Dream Sensor is sold separately, but can be a convenient option for those who don’t already have a sensor that they’re satisfied with. We haven’t had a chance to review the sensor itself, but it has generated a substantial amount of press. Regardless of whether you use DentiMax’s Dream Sensor or another imaging sensor, DentiMax’s imaging software is completely integrated with its charting module. After taking X-rays, the system will import all of the patient’s X-rays into their chart, so that you can see all of the X-rays associated with a given tooth upon clicking on the tooth in the chart. The software offers an image enhancement option, which uses an algorithm to bring out the contrast in the X-rays. There’s also a measurement tool, which, for example, enables you to measure a root in a root canal by dragging a line on the image. The charting module makes it easy to document all of the patient’s information. As we mentioned before, you can access all of the patient’s X-rays, and also take notes on each tooth with a few clicks in the charting module. The software comes with a set of icons that are linked to the most common patient notes -- which makes for easy note taking. If you add icons to the chart, they will stay on the chart so that the next time the patient returns, you can easily see the patient’s history. The software also includes periodontal charting, which enables you to record plaque, mobility, bone loss, furcation grades, bone loss, bleeding, and suppuration information. The software allows you to copy from a patient's previous exam to populate measurements and modify them as needed. 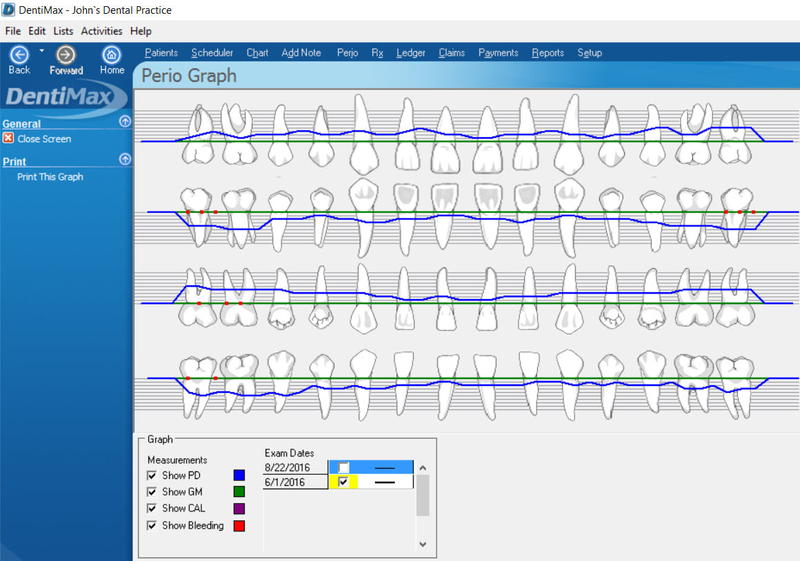 The perio graph is a nice feature that allows you to compare periodontal measurements across different dates, which makes it a great tool for educating patients about their improvement or degradation over time. DentiMax’s billing module doesn’t just help you keep track of the amount of money that you’re owed—it also helps prevent insurance denials by using quality assurance rules to validate your claims. The patient ledger maintains a list of all of the procedures performed for all patients and the amount owed. As soon as a procedure is marked completed, it will immediately be transferred over to the patient’s ledger. The ledger keeps track of the procedures that have and have not been billed. As you move through the billing process, the software will automatically identify insurance claims (with their corresponding procedures) as ready to bill, billed, and paid. Based on the procedure documentation and patient information, the software is able to automatically generate an insurance claim. If there are additional details that need to be added or changed, you can update the patient’s profile accordingly, and the software will automatically update the claim to reflect the newly added information. DentiMax is capable of sending electronic claims to virtually any clearinghouse, but they have a close partnership with DentalXChange and Apex EDI. Though we recommend electronic claim submissions, you can also choose to print the claims and send them to your clearinghouse. The software’s automatic claim validator looks for missing information in your claim and helps reduce the chance that your claim will get rejected. The software automatically alerts you when the claim is missing important information, so that you can revise it before sending it out. DentiMax comes with a suite of standardized reports to help you identify opportunities to improve your business. For example, the insurance management reports can help your office understand and manage insurance claims, making sure that you get paid in full and on time. 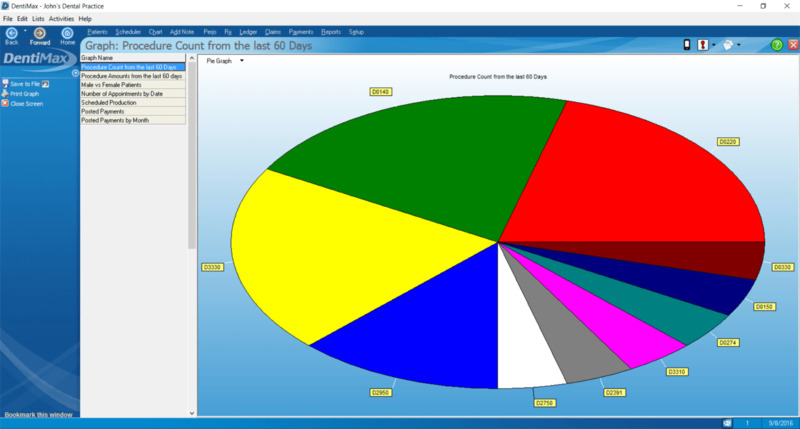 You can favorite your most commonly used reports for easy access. In the report properties, you can also specify which security level’s users are able to access and modify a certain type of report. This is a nice feature, particularly when dealing with financial reports, since you may not want everyone in your practice to be able to access that information. If there’s a report that the system doesn’t currently support and you’re not able to generate it yourself, you can reach out to DentiMax’s support staff, and they will work with you to generate the custom report. However, this feature comes at an additional charge. 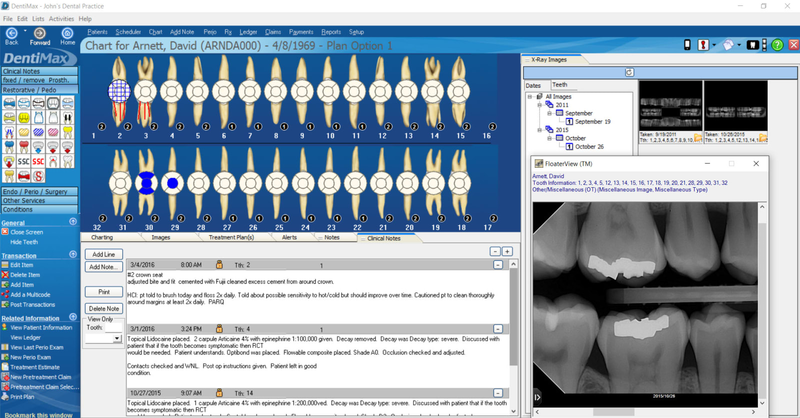 DentiMax is a comprehensive, fully integrated dental practice management software solution. Established over 12 years ago, the software is fairly mature, and includes most of the features that you need to run your practice efficiently. One downside is that the local version of the software is only compatible with Windows (though Mac users can use the cloud version.) If you’re looking for a time-tested dental practice management solution, then DentiMax is one of our top choices to consider. If you’re looking for an imaging sensor, then you may also want to try DentiMax’s Dream Sensor (sold separately), which is designed to integrate seamlessly with the software.